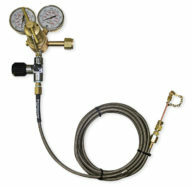 Control the flow of oxygen to the aircraft hose line on your aircraft oxygen service cart. 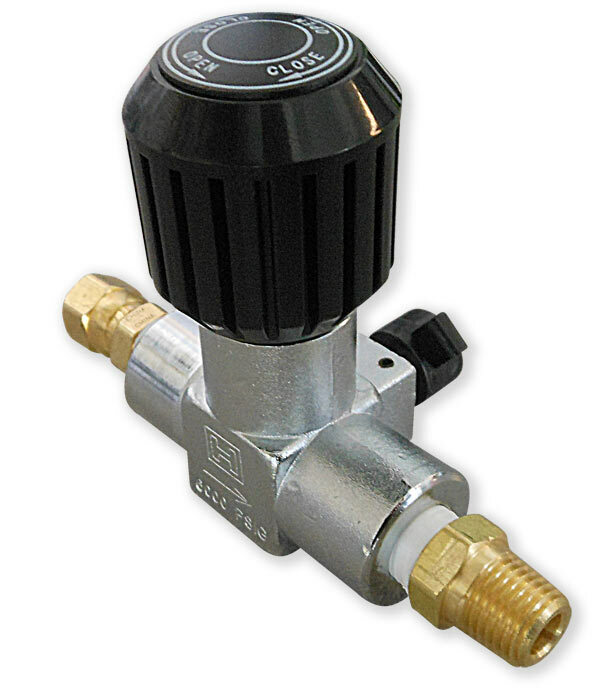 This valve kit allows you to easily adjust oxygen service cart flow via two separate knobs. The large knob controls the flow in the aircraft hose line, while a smaller bleed valve can be used to quickly purge high pressure prior to disconnect from the aircraft oxygen service port. Weighs 4 lbs. (1.81 kg). Constructed of heavy-duty materials, the Oxygen Bleed and Flow Valve Kit is delivered ready for a lifetime of service. The inlet and outlet ports on the Valve can be configured to specific customer requirements to ensure quick and easy install. 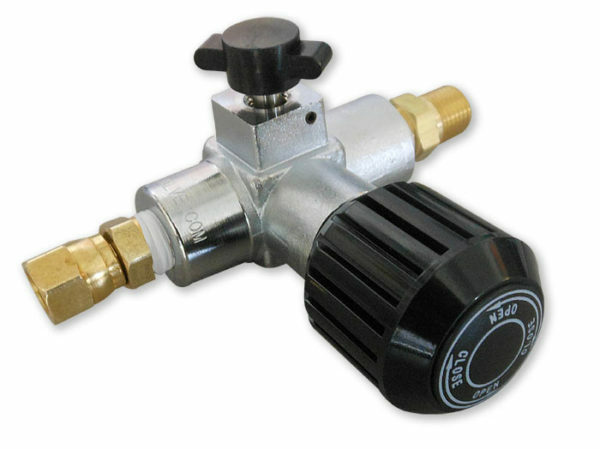 Simply install the Bleed & Flow Valve Kit inline between your existing regulator and or OB-30 oxygen booster/intensifier system and the aircraft servicing hose that connects your aircraft. 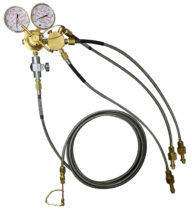 The Oxygen Pressure Valve Kit comes standard with brass (1) -4 FJIC (1) -4 MPT connection ends. 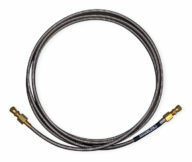 AERO Specialties oxygen service hose assemblies utilize -4 FPT connections. Valve Kit shown with -4 FJIC and ¼” MPT brass fittings. Custom brass fitting configurations available. Please specify when ordering. All oxygen servicing parts & equipment from AERO Specialties are delivered Oxygen Clean. Our technicians are specially trained to ensure that no combustible contaminates (such as oils, greases, dirt, fiber, etc.) are present on these oxygen-cleaned surfaces. Protect yourself and your equipment by ordering your oxygen servicing equipment from AERO. Beware: many of our competitors do not deliver their products to this standard. Failure to use oxygen-clean products in oxygen servicing can result in fires or explosions.